Floods and stormy weather had kept me away from my syndicate trout river at a time when it should have been at it’s best, but after a few warm days, I was ready to brave the Friday evening rush hour traffic in the hope of a few hours fishing the mayfly. Since my last visit the bankside vegetation was now in full bloom and mayfly were lifting off in droves, although very few fish were rising to them. I stood and watched a pair of black-headed gulls swooping down to the surface picking off the protein rich insects, a sight that I’ve not witnessed before. In the distance a cuckoo was calling. Tying on a parachute hackled bodied mayfly, which I liberally greased with floatant, I went in search of rising fish, that were accessible to my casts. This part of the fishery does not enjoy the benefit of working parties and every impenetrable section of bank seemed to have a large trout swiping with abandon at the mayfly among the overhanging branches. 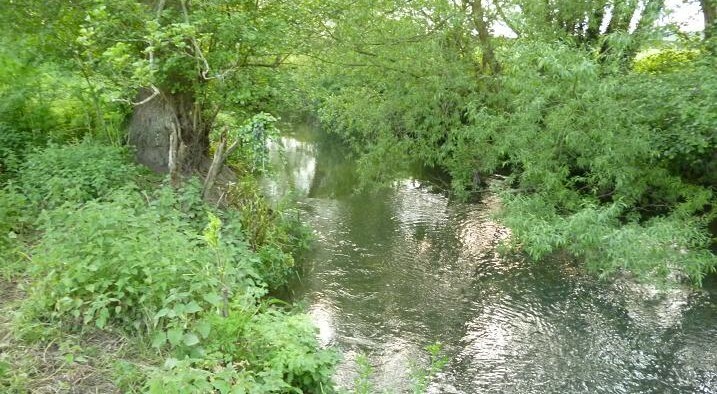 I’d walked half a mile downstream before I had half a chance of a cast, where a fish was rising up inside a tunnel of trees, dashing around taking multiple flies, as they drifted down to toward it’s holt. Picking my way along the high bank, I was eventually in casting range, extending my landing net in anticipation, while I waited for another burst of action. Splosh! The action began again as more mayfly climbed out into the surface film, to be gobbled down before they could stretch their wings. Aided by an upstream wind, I measured my false casts to the side of the fish, then aimed for the centre of the commotion. The fly was slashed beneath the surface, the trout’s tail flicking to carry it to the next victim. The strike saw an eruption of the surface, followed by head shaking rolls as it scorched off down stream, taking line and bending my little seven foot rod to the limit. Having lost my previous three fish from the river this season in these opening seconds, I was relieved when the brownie turned and dived deep, setting the hook firmly in the jaw, being only a matter of time before it would be beaten. I was in no rush, the landing net just reaching as I drew the trout over it. 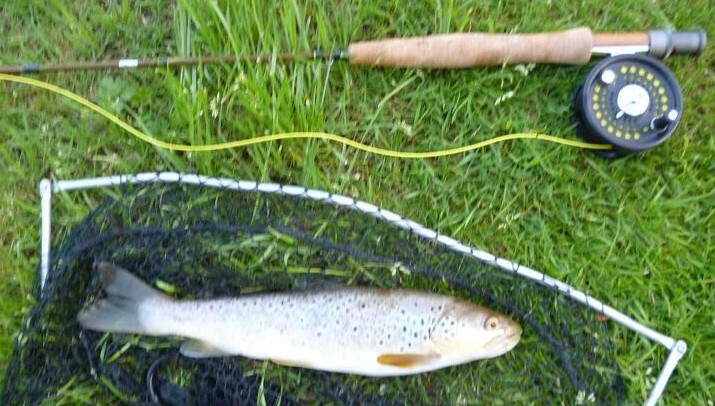 Already fat from feasting on nature’s short lived mayfly bounty, this 18 inch fish was soon returned in my landing net facing upstream, swimming out after a ten minute wait to recover it’s strength. As I continued downstream, I could hear more crashing takes among the trees and pushed my way through to the bank to see another trout attacking the mayfly as they drifted from under a branch. Gradually extending my casts, my fly was constantly ignored, the trout taking the genuine article only inches away each time. Taking a chance, I pushed the fly to the base of the branch, it settled, then was engulfed in a swirl, that exploded when the hook found bone. Not giving the trout time to dive to safety of it’s lair, I dragged it back on the surface, causing it to tail walk, before crash diving into the open water. Once again my 4 weight rod bent double taking the shocks, as another big brownie sought out sanctuary among the the roots, firm pressure bringing it back to the surface and the net. This trout measured 19 inches and fought like a demon despite despite obvious damage caused by a heron. Once released after recovering in my net, it headed back upstream to sulk beneath the safety of the overhang. I continued down to the end of the beat, watching other trout mopping up their free harvest of mayfly, but unable to cast a line, waders and definitely a pole saw would have helped, but it was good to see fish rising in a river that appeared barren a few cold weeks ago. So far this year, my river trout fishing season has been a near nonevent with visits lucky to see a take, let alone hook a trout, the sum total for at least half a dozen outings on three different waters, being three fish lost. The cold snap, that came with the first weeks of official summertime saw low water temperatures and little fly life. The rivers looked perfect, but nothing was moving. In the last week the wind changed round from the cold north to the south, with a double digit increase in temperatures bringing out shorts and T shirts from the draw, while the air was suddenly full of flying insects. 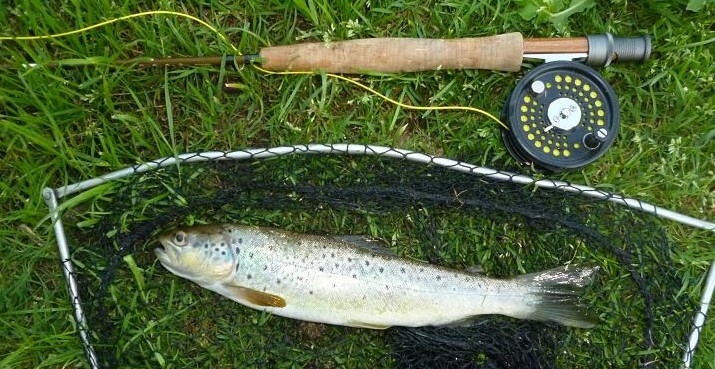 With a three day ticket and unable to fish my nearby syndicate river until Thursday, I hoped to finally christen my new rod and reel, but then the rains came, then came again, causing flash flooding that changed the clear waters to muddy chocolate. Thursday was full of warm sunshine and determined to fish, I took on the task of crossing evening flows of traffic exiting London, to get to an urban river that is rarely affected by floods, although I had my doubts, when I saw the river Thames rushing by in spate, during my hour long journey. 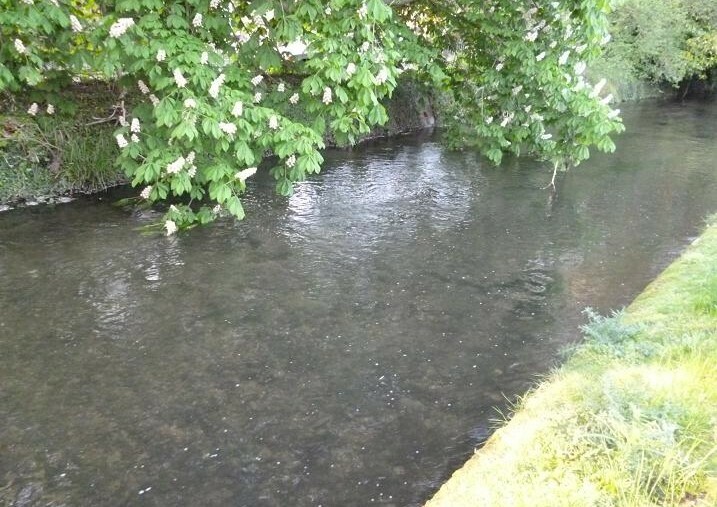 The chalk stream, once power for many mills and factories along it’s route, looked clear as I drove over it to park among the houses, seeing a wading angler already fishing downstream. I usually start downstream and walk up, but without wanting to intrude on the other fly fisher, my only option was the fifty yards above the bridge. Stopping to look upstream, the surface was covered by zigzagging grannoms, while here and there mayfly were lifting off, although nothing was rising to them. Looking down to the clean gravel, trout are often visible, but there were none on show in the evening light. At this point I realised that my trout bag clear out the other day had not resulted in the return of my polaroids. 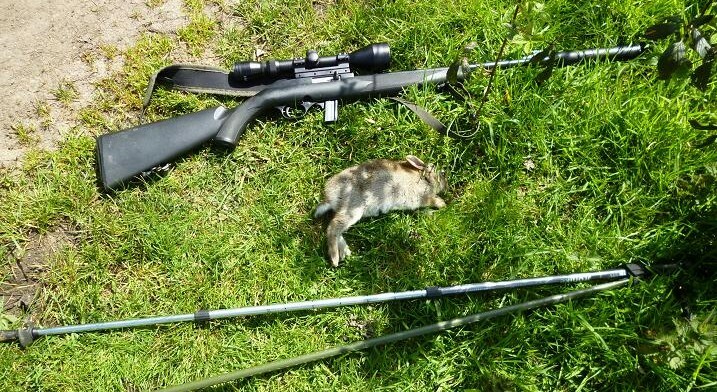 Tying on a size 16 mini gold head, gold ribbed Hares Ear, I began searching out the runs between the early weed growth, casting up and across, watching the greased leader as it drifted back with the rapid flow. The line sped upstream and I lifted the rod to see the grey outline of a trout appear like magic above the gravel bed, as the hook took hold, then a flash of gold, when it turned to rush downstream. So far this year, this has been the time when the barbless hook has come free, but it stayed firm, putting a satisfying bend in my 7 ft 4 WT rod. The run was stopped, then turned, the brown running back upstream past me, before drifting back to the net. 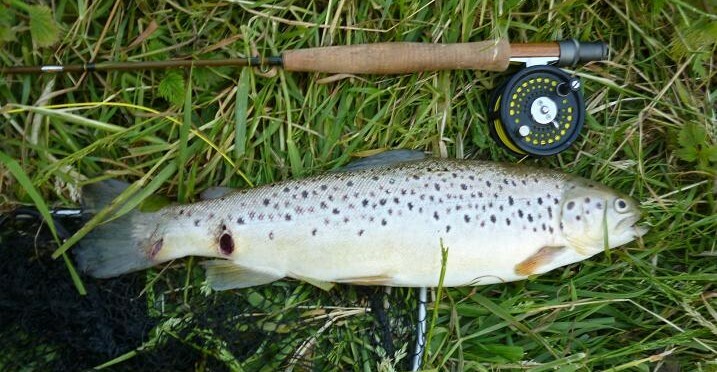 Signs of a late spring, this wild brown was very lean, the 13 inch fish full of fight, but well down on weigh for May, the tiny gold head nymph firmly set in the scissors of it’s jaw. Returned immediately after this pic, it was held facing upstream until it kicked away to freedom. 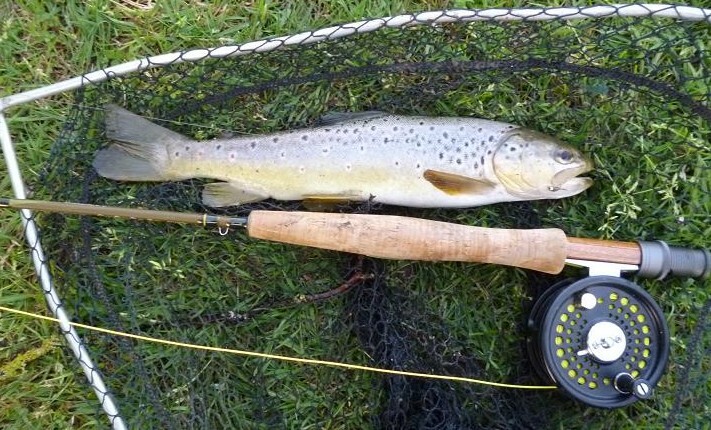 The nymph soon struck gold again, with a 9 inch brown running away upstream, fighting well beyond it’s weight. Unhooked, I held it up for another pic, only for it to flip back into the stream to be gone from sight. Twenty minutes into the session and I’d already had two trout, restoring the faith in my ability. Moving further upstream, a laurel bush grows out across the river, acting as an upstream barrier and a safe haven for larger fish. Making casts to the base of the bush, the leader zipped forward and I was playing another good trout, which boiled on the surface, then thankfully got it’s head down, pulling hard upstream to the bush, before giving up to run in the opposite direction, eventually bringing the wildie onto it’s side and the net. At 12 inches , this was another thin trout in need of a few mayfly hatches to pack on some weight. 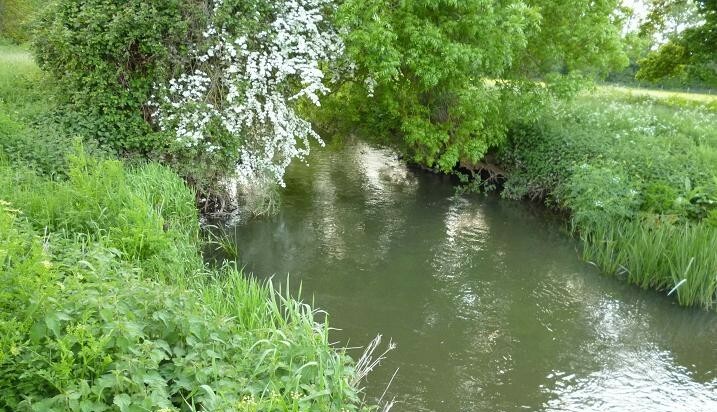 I’d been on the water for half an hour and had covered my stretch; the other angler had gone, having worked up to the bridge, so walked back downstream two hundred yards to where the river passes under another road bridge and out of sight behind houses. The sun was already hidden by the trees as I fished upstream, the light not penetrating the river, not ideal for the nymph. There were no more takes, possibly the wading angler had put them all down. As I walked, mayfly began to lift off, skating free of the surface and trout began to rise all over the river. I had no mayflies with me, not expecting a hatch until later in the month and looked for something bushy with a wing, finding a size 12 Deer Hair Sedge. The light was going fast and the trout were rising, a combination to make the tying on of the Sedge a matter of “more haste, less speed” as the line refused to enter the eye, then once successfully passed through, the line had a mind of it’s own forming the knot. The trout waited, many jumping clear of the water in a desperate bid to gorge themselves before the hatch finished. I made a cast to the general area of splashes, the fly disappeared in a swirl and contact, a trout was on, cartwheeling across the surface toward the bank. I swung it in, the four ounce brown sliding through my fingers, rustling through the bankside stinging nettles, before falling back with a plop. A few false casts and the fly landed again, the wind dragging the line, a better fish taking as I lifted off, which fought unseen by me, applying pressure to bring it to the surface, it’s splashes guiding my net. A more plump brownie hooked in the nose, which was lowered back to the water in my net to swim free. The light was fading and my picture was blurred, but I’ve posted it anyway. I had broken my duck with some exciting fishing and the new rod had performed as I’d hoped. Next visit will include polaroids and a box of mayflies. My shooting and fishing plans were put on hold this week, with the arrival of warm winds carrying thundery showers, that saw me trapped in the house, scraping round doing unnecessary jobs, much to the satisfaction of my wife, who resurrected a long lost list of chores. Eventually these were done and I moved on to cleaning my rifles, then sorting out my fly fishing bag. Attempts to work in the garden were thwarted by fresh showers every time the sun broke through. I found myself reciting a nursery rhyme of my childhood “Rain, rain, go away, come again another day” a chant that my siblings and I would make, while pressed against a misted up window, as the rain lashed down. By 4 pm today, only a slight drizzle was coming down and donning my waterproofs, headed out on foot to my local pond a quarter of a mile away. 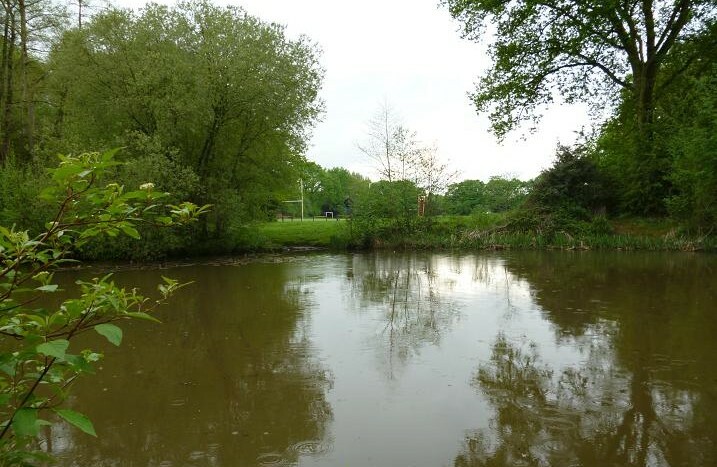 True to form, by the time I reached the pond, a fresh dark cloud had begun disgorging heavy droplets, but by now I was beyond caring and went about duties, setting up a pole in the hope of a few carp before the day was out. 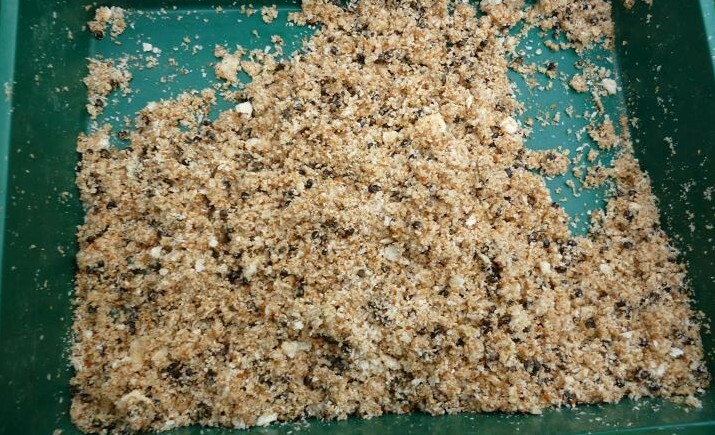 Mixing up some ground bait of coarse bread crumbs, laced with hempseed, dusted by ground carp pellets, the lot was balled in along a line 7 metres out. The surface erupted as rudd attacked the feed, the lightly squeezed balls spreading out on the bottom an investment for later. With sweet corn as hook bait, I scattered a dozen grains over the area, then returned to setting out my stall with everything to hand, with no need to leave the comfort of the tackle box. The final job was to attach the float rig, a cut down canal grey waggler float to a size 14 barbless hook. Within seconds of the sweetcorn hitting the surface, the float sailed away and I lifted into the first fish of the afternoon, a four ounce rudd. Rudd followed rudd in quick succession, aided by the rain, which lubricated the pole as it was shipped back and forth, the brightly coloured fish beginning to fill the net. There was no let up in the action, the only variation being a nice roach that managed to get to the front of the queue. It was 90 minutes into the session at 6:30, that bubbles began to erupt from the fed area, as the long awaited carp moved in, pushing out the rudd. Like a switch being pulled, the bites changed from zoom aways, to gentle dips of the float, sometimes the tip seeming to vibrate, before it slowly moved away and down. 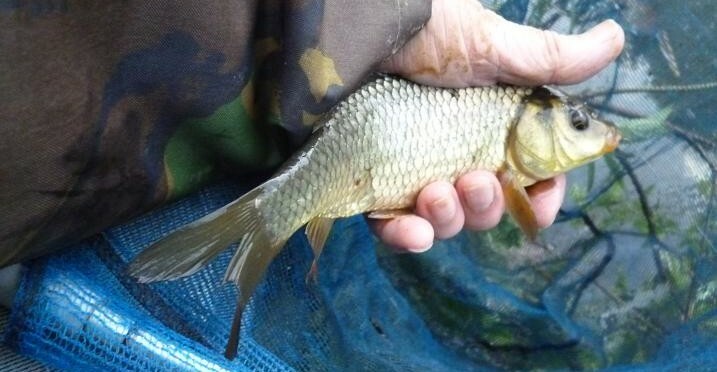 A small common was the first in the net, it’s bite so like a crucian, the elastic coming out of the pole, as it ran for cover. 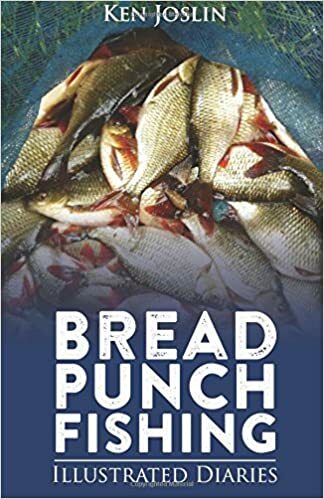 The next bite was definitely a crucian, the juddering fight a dead giveaway. Having cursed the constant showers, the sun now appeared below the clouds as it sank in the sky, it’s glow on the surface blinding me to the delicate actions of the float tip, forcing me to fish either side of the glare, taking me away from the shoal of crucians, but to the attention of the common carp. The bites were slower, but more predictable, taps and lifts developing into unmissable slide aways. The sweet corn was still doing it’s job, the size of grain no guide to the size of fish, the biggest common of the evening falling for a tiny piece. This fatty took the elastic out to full stretch in an attempt to reach the safety of a bed of lilies, but the hook held. The carp kept coming right up to my allotted cut off time of 8 pm. I could have gone on catching, but my wife had a home cooked shepherds pie waiting for me, the rumbles that I could hear being my stomach not thunder. 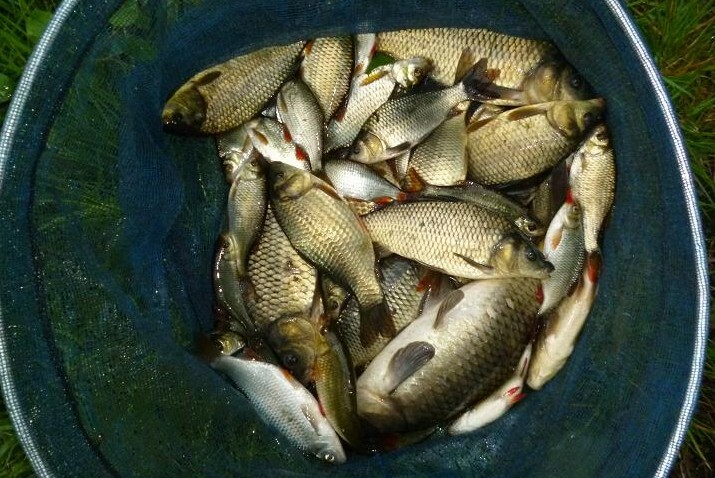 The rain had been warm, everything was wet, but the session had proved productive, well worth a soaking. The carp crowded out at the many rudd in this net, just under 14 lb of fish proof of a busy, but rewarding three hours. 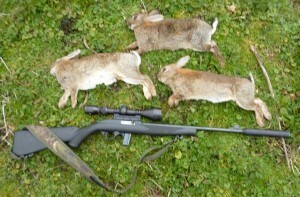 Magtech .22 finds rabbits in the bluebell wood. The first days of May came blessed with sunshine, although a cold wind greeted me as I left the protection of the stables at the equestrian centre this week. 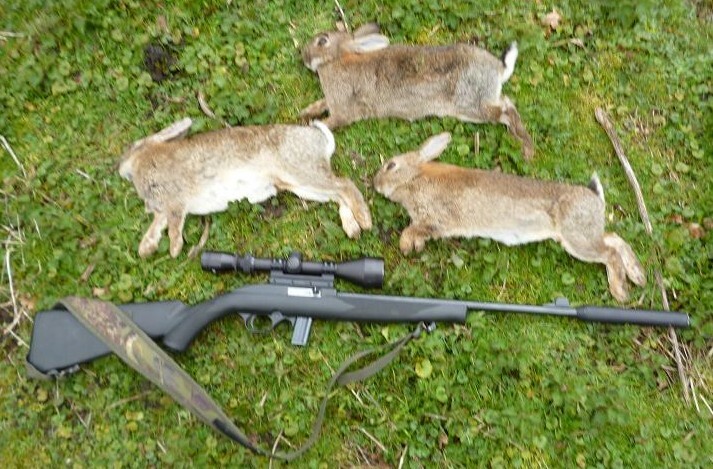 Regular visits were beginning to have a visible effect on the rabbit numbers and I was keen to keep up the pressure, as now is the time of maximum rabbit reproduction. 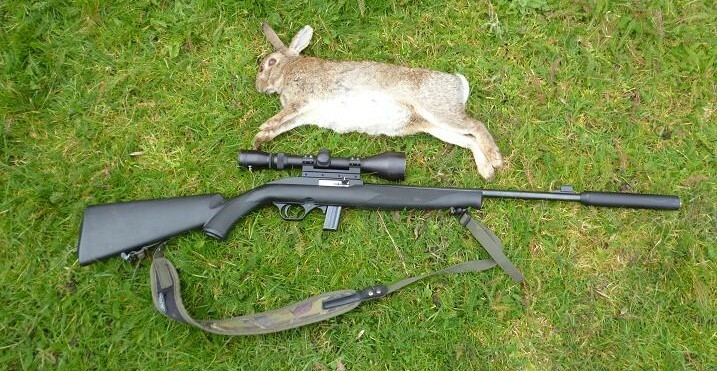 I had not gone 50 yards, before the first sight of my quarry in long grass beside the path and I swung my shooting sticks out to support the rifle, knocking over the rabbit at 40 yards. This was a healthy juvenile from an early litter of kits, a result of the mild winter. These make tender eating and go well on the BBQ, or just fried with onions. Twenty yards on, an adult had it’s head down feeding on a lawned area near the training ring, slumping forward from a full on head shot. Carrying on toward the wood, I expected to see rabbits along the bordering ride as usual, but today they were absent and pressed on through without seeing any, thinking that my previous efforts had sent the survivors into a nocturnal feeding pattern, having taken over thirty in recent weeks. 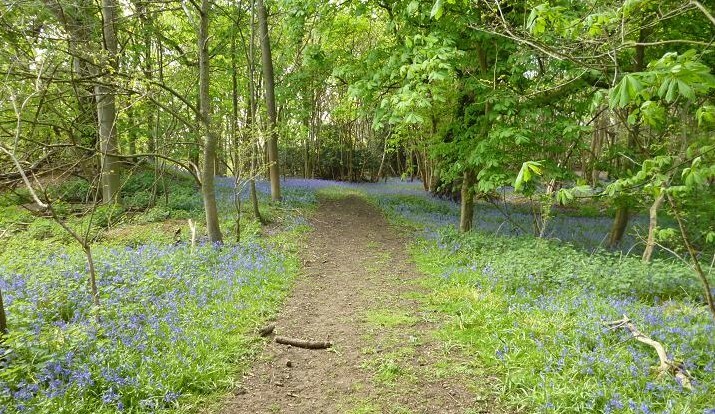 This part of the wood always heralds the seasons, snowdrops of winter, giving way to the daffodils of spring and now bluebells of early summer. The heady aroma of these short lived blooms filled the air as I walked through, the new leaves shielding the bright sunshine of the afternoon. 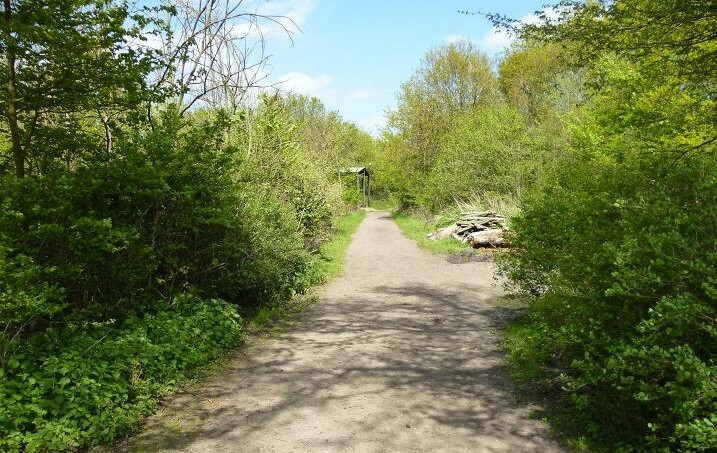 Near the exit from the wood, a ride joins the path at right angles, where I often see rabbits and I slowed in anticipation, ready to crouch down to peer round the corner. As I did, a large brown rabbit trotted from the ride onto the path fifteen yards away and froze. 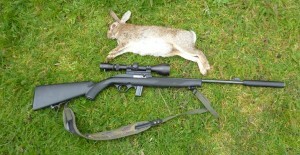 In the scope it was blurred, but sighting on the chest above the front leg, a snap shot bowled it over. 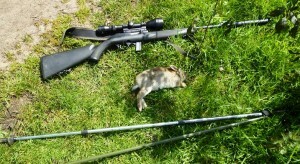 Prone, I looked round a bush at the end of the ride to see two rabbits skipping about forty yards away and resting on my bag got a bead on the first, only for the other to run in front of it each time. This movement went on for several minutes before one stopped long enough for me to squeeze off a shot, which bounced it high in the air. The other disappeared around the corner at the end, then turned and ran back toward me. I missed with the first shot, but hit it with the second, making sure with a third. Back out into the bright sunshine, I circled round the outside of the wood, the white flash of tails in the distance the only signs of long gone rabbits and I made my way back to the van, heading out into the traffic from this haven among the houses.